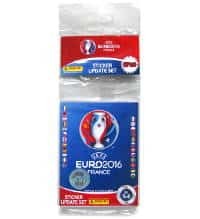 "After the World Cup is before the EURO" as a long-known proverb goes and in this case the EURO 2016 in France really is something great and unique. 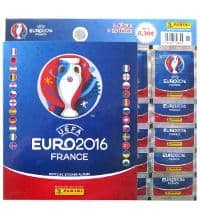 Since this is the first time in the history of the EURO that 24 teams instead of 16, as before, take part in the final competition in France. 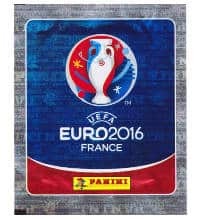 This also means that the Panini EURO 2016 sticker collection will be as big and as spectacular as the two last ones. 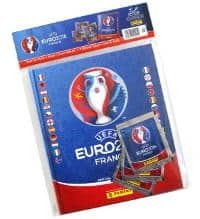 The qualifying rounds for the tournament only start in several weeks but the preparations for the event in Europe already begin. 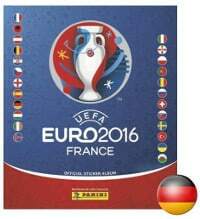 With the host country France, the EURO again takes place in a neighboring country of Germany. 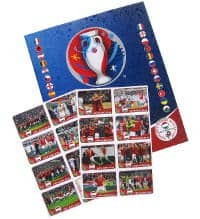 That means that we are right in the middle of the football fever and the collecting fever. 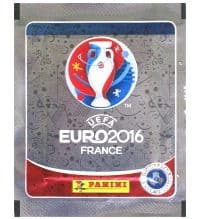 Some facts and dates of the Panini Euro 2016 in France are already certain and Panini might already have started with the planning and the designs. 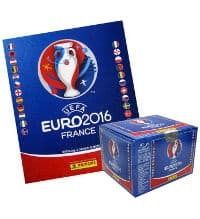 Looking at the official logo of the EURO 2016, one recognizes that the country-specific colors blue, white and red dominate. The "Coupe Henry Delaunay", the winner's trophy which has been awarded since 1960 and which is named after the first UEFA General Secretary, forms the center of the logo. 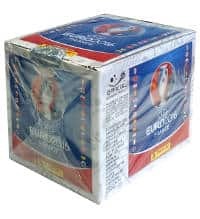 The trophy is kept in the French national colors: blue, white and red. 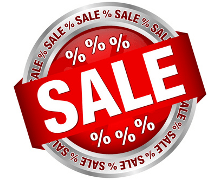 It is surrounded by a slightly grey circle that could symbolize a football. 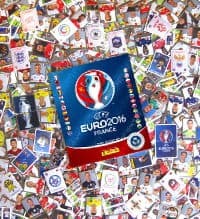 Within this circle and around the trophy, there are some football related symbols and features, such as the center spot and the corner point. The whole image is streaked with bent lines that can be considered as Football Field Lines. 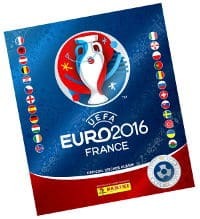 The logo of the EURO 2016 France includes many artistic aspects that are combined with football related elements. 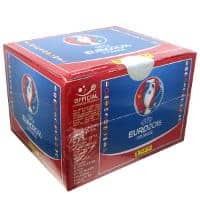 The main focus of the logo is clearly the trophy that is held in the French colors, also surrounding it. 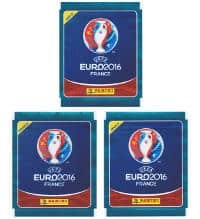 Based on this image, it will be exciting to see how the new Panini EURO 2016 sticker collector's album will look like. 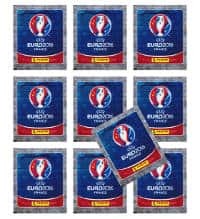 The motto for the upcoming EURO is "Celebrating the art of football". France is emblematic of art, love, passion and serenity. 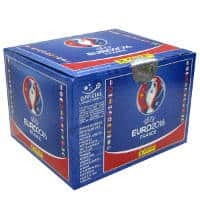 All of these accents are included in the logo and motto presented by the UEFA. 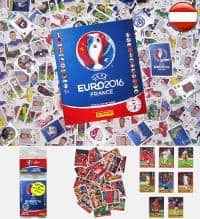 In view of those facts, Panini will also be eager to express all of these facets and impressions in the new sticker collection EURO 2016 France. Eight venues of the football World Cup in 1998 were chosen again. 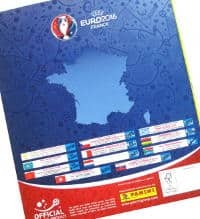 The venues Montpellier and Nantes are replaced by Lille and Nizza which are the new venues for this year. 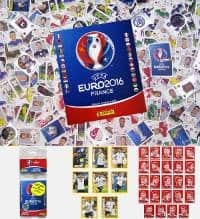 Here at Stickerpoint you can find the latest information about the EURO 2016in France, as well as about the Panini EURO 2016 Sticker collection. 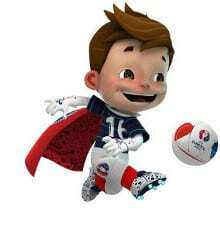 Since the 11-30-2014, it is definitive how the mascot will be called, namely Super Victor. 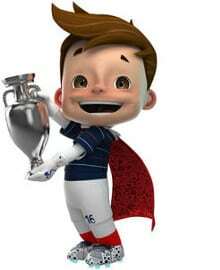 It has been known for a long time, that it is a boy with brown hair and a red cape who wears a blue and white tricot with the number 16 on his chest. Only his name wasn't published yet. The fans could choose from three names which were up for a voting that continued until the 11-26-2014. 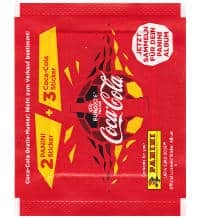 The three options were Goalix, Driblou and Super Victor. The mascot also wears white glows, red stirrup sock and football boots with turquoise cleats. 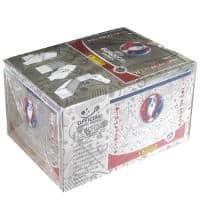 On all of the already published motives he has an open mouth with a broad smile on his face. 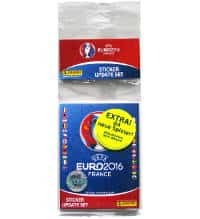 Due to the cape the official mascot of the Panini EURO 2016 is strongly suggestive of a popular super hero. 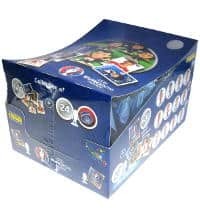 And this is exactly what it is supposed to symbolize; since, according to the story, the boy gains superpowers after finding the magic cape, the ball and the football shoes. 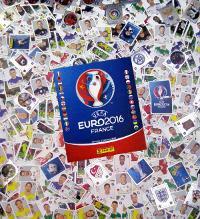 It is certain, that the mascot will appear once or more that once as a sticker in the Panini EURO 2016 album. We assume that this will be the case in the intro part, as it usually was until now. 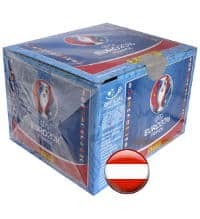 It is likely, that it will also appear, as it was the case in the last two EURO series, on the pages of the teams. So, more than one reason to be curious! 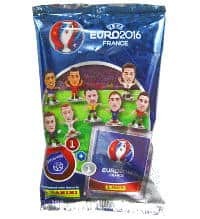 It has been recently announced that the official ball for the Panini EURO 2016 will be named "Beau Jeu" which means "Good Game" in English. 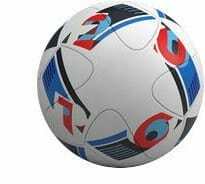 The football, produced by Adidas, as many times before, is kept very simple and the design of the ball is almost a bit retro. 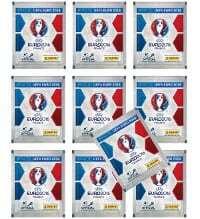 The colors used correspond to the logo and the French national flag blue, white and red. 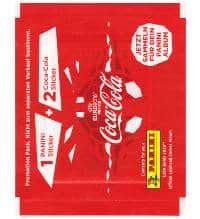 There is also a hint of black present in the design. 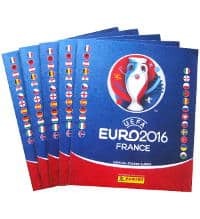 On each of the four elements of the playful design one digit of the event year is printed on 2-0-1-6, as well as the letters E-U-R-O. Not much is known about the flight characteristics of the ball yet. 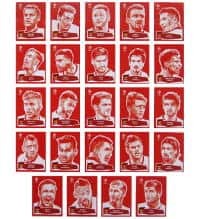 However, it can be stated that it will also flutter unpredictably at high speed which will make him the enemy of every goal keeper. 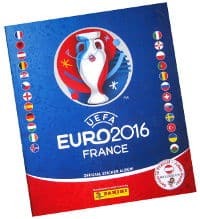 As far as the Panini EURO 2016 sticker album, we assume that the ball "Beau Jeu" will very likely get is own sticker. 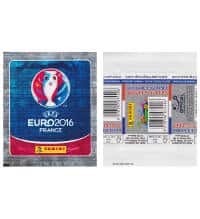 At least, this was the case in the last two big tournaments 2012 (EURO) and 2014 (World Cup). 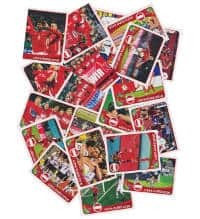 For each football, there was a sticker in the sticker collection.